The reason why I have decided to go a bit deeper into Delphi, is because I will go to a Delphi coding camp in about 1 month in Frankfurt. Thus, I have to be a bit more prepared for the language. 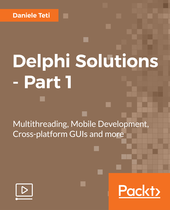 So, I have decided to ask the nice people from PacktPublishing for some Delphi related materials and they have kindly send me the first part of the Delphi Solutions video. Reviewing a video for technology is always a challenge for me. Especially for a language, where I have not a lot of experience on. To be honest – my experience with Delphi was from my high school in Sofia, when we were learning the basics of the programming. Probably one of the reasons why I did not become a programmer after high-school, but some 6 years later. Anyhow, on the video we have the code files and high quality of recording. That’s something important to start with. We start with the basics of Delphi and the Delphi IDE. Here is probably something that kind of disappointed me – I was expecting that we would start with the ABC of the language, thus I would remember the nice times in High School, when the whole class was waiting in front of the blue/yellow screen of Pascal just to see how it prints the numbers from 1 to 100 in a row. However, this is not the case – the videos think that you can program quite well with Delphi/Pascal, as far as the video does not explain the basics. Which is bad only, if you have no experience with it. E.g. – it mentions events plenty of time, but it never explains what they are.Furthermore, the video is not exactly about programming with Delphi, but more about using the IDE and doing some applications with the code already. It’s not like watch & learn how I code video, but more like see how to use the IDE video. Which is not bad also. But not what I have actually somehow expected. In general, I am giving it 4 stars, because the lessons are interesting. The fact, that there is no introduction to the syntax and no code is written in “real-time” can be considered also as a part of the “pros”, not only of the cons.